At Two Bare Feet, all our stand-up surf paddleboards are designed with wave-riders in mind. A key feature of our surf paddleboards is their reduced length and depth. All of our surf SUP models have a depth of 4.75”. Provided you do not exceed the recommended payload, a board with low–medium thickness will have enough volume to provide a stable ride, while keeping the centre of gravity low to the water’s surface. This is important when riding on choppier waters, as it affords for quicker turning and better manoeuvrability through waves and in whitewater conditions. Who are surf SUPs for? Unlike Touring SUPs, surf-style boards are not optimised for straight-line speed. They can be challenging for a newcomer to control, making them a more favourable option for intermediate and advanced paddleboarders. Compared to other boards in our range, Two Bare Feet’s surf SUPs have a more compact design. This means they can be used as all-round boards by smaller riders, such as children, teens and small adults. We have a wide range of high-quality surf SUPs which are built to suit your specific requirements. 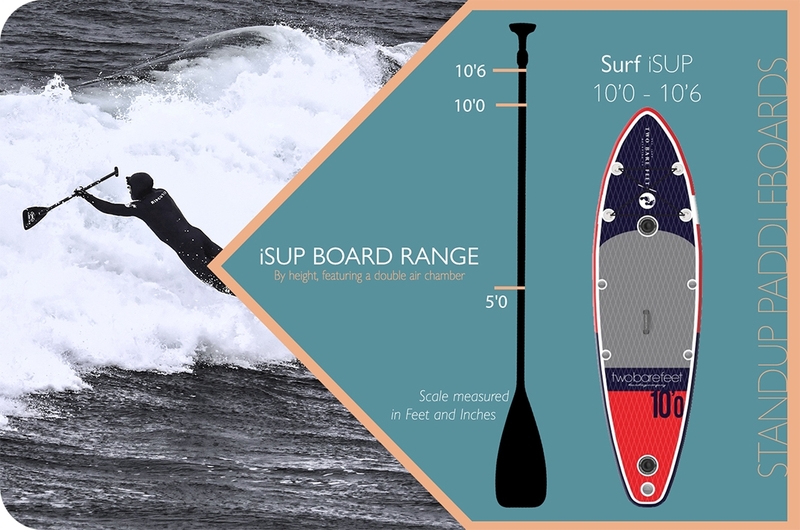 Our boards are all inflatable to 22.5psi, which is the highest air pressure rating used by iSUP board manufacturers. This guarantees a very stiff inflatable SUP, and demonstrates the confidence we have in the overall construction and build quality of our products. In addition, all of our surf-style inflatable stand up paddleboards are covered in a diamond-patterned heat-moulded EVA deck grip, which prevents damage to the top surface. Our Inviato model is a popular choice for entry-level riders. With its single-layer skin, the Inviato model differs to other choices, but the premium, reinforced PVC material will certainly stand the test of time. It’s 10’0” length is short for a standard inflatable paddleboard, but this contributes to the enhanced manoeuvrability which makes it ideal for surfing. In addition, its wider than average 35” width greatly adds to overall stability. It’s perfect for anyone who may need added reassurance when trying to stay balanced. At 10’0” in length, the lightweight Aerostar Surf is optimised for manoeuvrability, while its 35” width provides a more stable riding experience for less experienced riders. The board is made with heat-laminated Double Wall Fusion (DWF) PVC. This increases the board’s strength, rigidness and durability. The Aerostar 10’6” model shares many of the same benefits of the 10’0” Aerostar, but is notably longer. This makes it better suited to larger riders, thanks to the increase in board volume. Average-sized riders may also opt for this model if they want a surf SUP with enhanced tracking and straight-line speed. Unlike our other surf models, the Sport Air Surf iSUP features an additional laminate layer on the underside – giving the board additional strength and protection. At 33” wide, our premium surf SUP is slightly narrower than other boards in its category. The slimmer profile reduces drag through the water and enhances overall manoeuvrability. With the additional control afforded to the rider, the Sport Air Surf is the perfect choice for an intermediate or experienced paddleboarder who wants to push their performance on the waves. The double chamber version of our premier surf SUP is one on the highest performing models available. The additional air chamber further improves stiffness and durability, giving you a stronger board that will easily endure the strains placed on it while surfing. The extra chamber also acts as a key safety feature: with air distributed evenly across the board, it minimises the chances of the SUP fully deflating if it is punctured. Our boards are also available in a broad range of colour schemes. Whatever your tastes, we’re certain you’ll find a board that truly expresses your individuality.